Education and Research as Essential Instruments for Acquiring and Extending Knowledge. Knowledge is an essential part of our consciousness, emotion and behaviour. Human beings have been, and still, in constant search about knowledge to understand themselves, their environments and their needs. Only in recent decades, education and research became indispensable global instruments for acquiring and producing knowledge where both of which involve “understanding” rather than “consuming” knowledge. Well-established and gained knowledge are continuously structured and coordinated in packages and sub-packages “the so-called disciplines”, e.g. mathematics, natural science, astronomy, medicine, economy, political science, agriculture, veterinary, animal husbandry, human sciences, law, environment…. etc., to serve education with feedback impacts on technology, industry and consumption. Beyond existing knowledge there have been increasing interests for research, i.e. search about new knowledge and for extension of our knowledge stocks. But why do we need research, isn’t it enough with what we already know? Isn’t “business as usual” what makes the market stable and keeps the machinery of production spinning fast without interruption? Why do we need to question the knowledge we already know, improve our technology and modify or even re-shape our industry? With these arguments in mind, how and where can we do research? And who can do research, and what and where are the end-users of research? Knowledge has no barriers and the expansion of knowledge, i.e. through research, is a necessity driven by curiosity, search about the absolute reality, and the needs to uncover the very secrets of life. To understand such secrets, needs and make use of them, in particular to support and improve our lives and to comprehend the driving forces of life, penetrate in their details in order to protect it from the degradation and damage that can eventually lead to unavoidable collapse. As life on earth is part of a larger universe and an important consequence of its evolution, this makes knowledge inclusive with almost unlimited boundaries. Also, as humans and populations keep expanding in terms of growth, culture mosaic, divergence in life-style and emotions, complex consumption pattern, diminishing natural resources and an ever-increasing problems of waste and pollution. Also, our constant search about suitable means “sustainability” for survival, communication and interactions, research becomes not essential but even imperative. Education, in this context, is a pre-requirement to pursue research. Without good education, in particular high quality education, it would not be possible to maintain our knowledge in high-quality, advance and improve our knowledge for the well being of humans and future generations. Research, as also the case of education, requires dedication, motivation and discipline, and above all transparency and a good deal of inspiration. It requires focus, hardworking and strong self-steam. Ancient civilizations demonstrated that even without high-tech it was possible to overcome the threats from nature and even to grow exponentially but with increasing damage to nature. So, with better attention to education, research and technology we must be better prepared to face future challenges. Research is a mean to structure, compile and coordinate existing knowledge to find out gaps, limitations and weaknesses in all available knowledge. It involves setting-up goals and objectives to create plans and to seek solutions and strategies for either extending knowledge, fundamental research, or making use of knowledge, applied research. Development of new knowledge may lead to discoveries where existing unknowns can be turned to known, but research may also result in new unknowns. Turning unknowns to known and new unknowns is how our knowledge stock keeps expanding. This, however, creates a paradox both in the landscape of education and research as the expansion of knowledge may seem as a process of divergence. In reality it is, also, so as the expansion of knowledge involves production of new fragments of knowledge which at the same time makes knowledge more coherent and consistent. In this context, understanding the existing knowledge and searching about new knowledge both require convergence. Though this is evident in research, it is far from being obvious in education, which is a pre-request for research. This paradox, is the very reason for increasing problems, difficulties and failure in education and the enhanced frustration of students to perceive and recognize the coherent nature of science and thereby the direct relevance to the market in particular in the developing countries where the gap between science, technology and the market are enormous. The “apparent” divergence and fragmentation in science, and the complex and unclear connection with market and human needs, creates increasing barriers in education and promote major obstacles for students especially what regards motivation and setting-up their own Career-Development-Plans. This has, also, promoted accelerating gaps in universities what regards education contra research. For students education and reseach require patience, strong motivation and early interest which is directly linked to early stage in school education, education environments and tight follow-up and engagement by parents. For universities and schools, education and teaching should, as much as possible, involve coupling to the market and society needs, strong focus on raising scientific motivation and market awareness as well as seeking linearity in knowledge through smooth transitions and remediation of gaps. 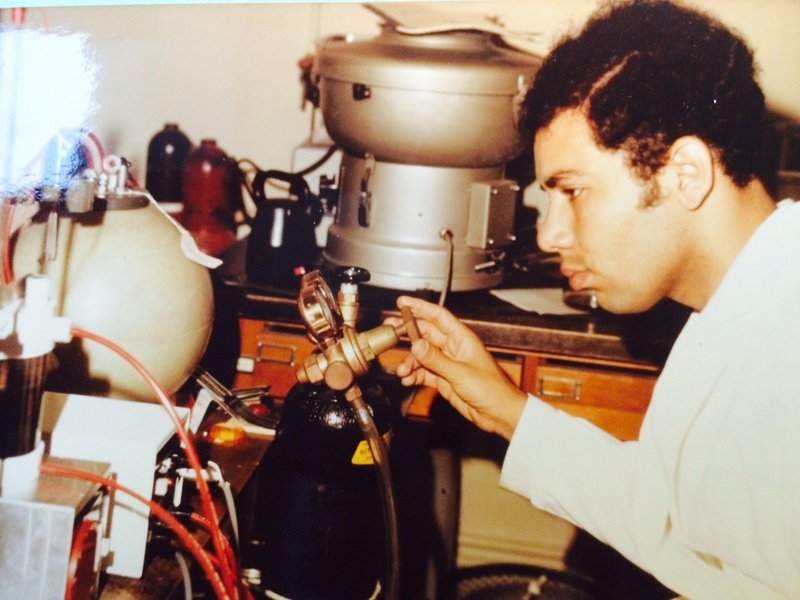 The upper figure – Ph.D. work involves improving and refining existing knowledge; here the author of the article Farid El-Daoushy performing some research experiments in the early 1970s. The lower figure – Environment and climate research involves field studies for observations, collection of data and samples, for laboratory analyses, to uncover the evolution of life and to assess and understand natural and man-made impacts. 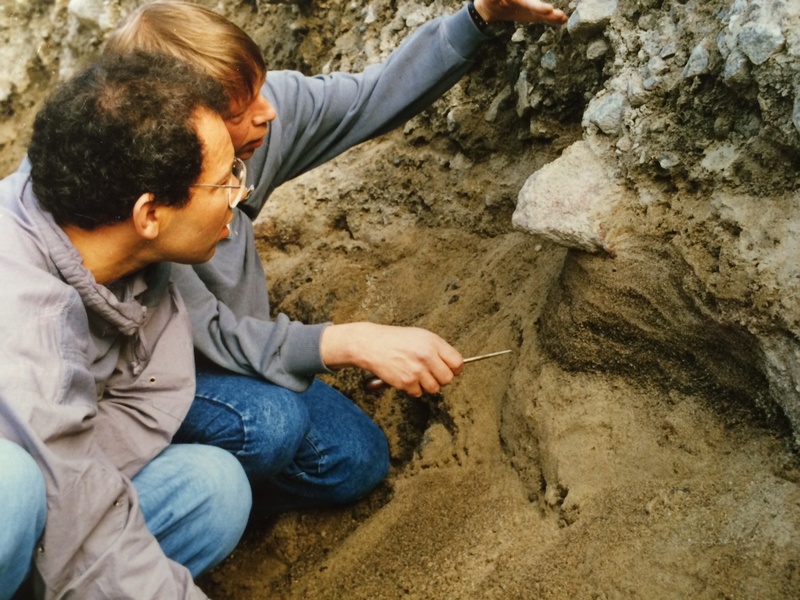 Farid El-Daoushy on the right, in a scientific discussion during a Scandinavian earth-science excursion in the late 1980s. This entry was posted in Education & Research, Human Resources, Politics & Infrastructure, Public Awareness, Technology & Industry on January 3, 2014 by farideldaoushy.